Vintage movie poster for sale of the classic Hollywood film Jack and the Beanstalk (1952). Jack and the Beanstalk is a 1952 comedy film that starred the hit comedy duo of Abbott and Costello. Based on the classic Jack and the Beanstalk fairy tale, the film was a success. Printed in India during the local release of the film in the late 1950s, this hand painted movie poster for sale was originally intended for publicity of the film but never ended up being used. This old hand painted movie poster for sale was originally designed in oil on canvas format by an art studio in Bombay. 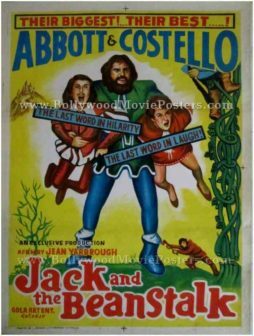 Abbott and Costello are seen in a hilarious avatar in this original Jack and the Beanstalk vintage poster. Set against a catchy yellow background, this vintage movie poster features interesting typography. The poster features an announcement at the top that declares the film as Abbott and Costello’s biggest and best film till date.